Cool! I'm streaming these videos through Twitch, downloading, and speeding them up. Learning the hard way not to stream music in the background (kept getting censored / blocked). Still really clumsy at it, but it is seeming like a good platform to spread the word. Usually get somebody asking, "Hey, what program is that?" What are you using to capture? I was trying to get youtube's streaming feature to work with it, but I had no luck. I may give OBS a shot though. Last edited by gomi on 18 Nov 2015, 02:27, edited 1 time in total. Aaaand another. Figure and color study with some playing around at the end. Started crashing a bunch when working with layers and big brushes. Neck and shoulder are so goofy, haha. Thanks for the software recommendations. Now I need to steal my wife's gfx card. 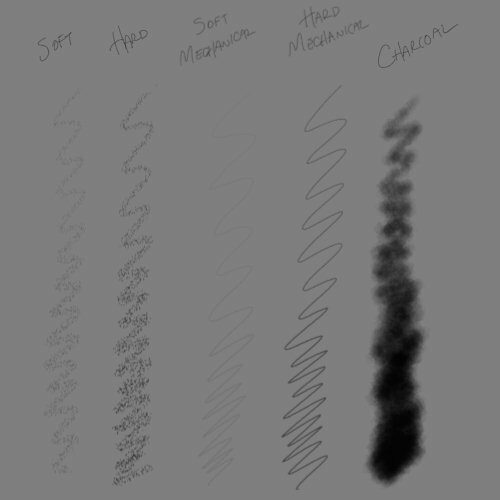 Here's the set of sketch brushes i'll be using in the next few videos. You're welcome! Just passed 1000 hrs logged and over 100 completed works in Black Ink. Thanks for that!